Description: A westbound sits in the siding at Murray. 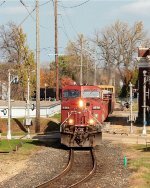 Description: Train 298 approaches the Minnesota Highway 29 crossing as it arrives in Glenwood at the end of its run across the Elbow Lake Subdivision. Description: CP 8558 brings X50030 east past the CSX Fowlerville depot. X500 is the last CP contract train left on the CSX Plymouth Subdivision. Description: 38T makes good time heading towards Rathbone as they continue east on the Tier. Description: Just outside of Addison now 38T continues towards Gang Mills and will be meeting one at Elmira. Description: After meeting 12T at the appropriately named CP Elmira 38T pulls hard to get to track speed as they head over town. Title: CP 8558, CP's Tomah Sub. Title: CP 281 about to rumble beneath 27th St. Title: 281 about to rumble beneath 27th St. Title: 281 rumbles beneath 27th St. Description: After missing the train at Fort Erie, I caught up to Train 255 at Ridgemount Road crossing, where I was able to climb onto some new rail ties for a higher angle as the train roared by. Description: Close behind the first ethanol train is a second, rolling east at 0909.